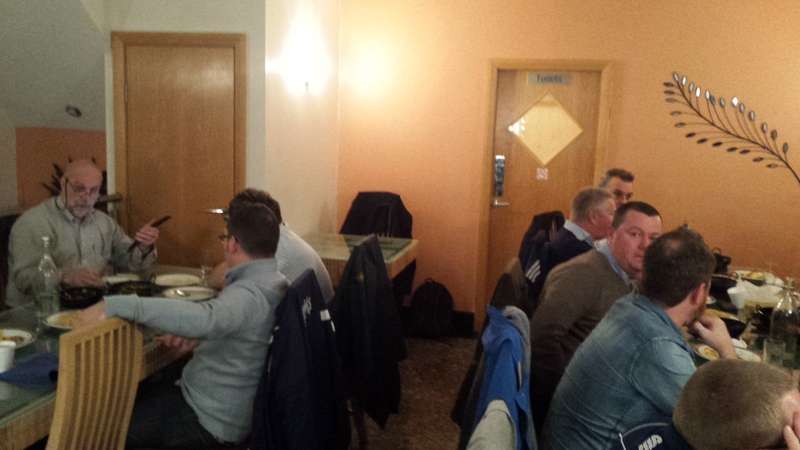 Last Thursday I travelled to Ayr for the final event of the Digital Commonwealth project. I have really enjoyed working on this project, led by the University of the West of Scotland, which used the Glasgow Commonwealth games as a hook to encourage school children, community groups, students, and individuals to tell digital stories about themselves, their hopes and aspirations, and about their relationship with the Commonwealth. If you haven’t seen it yet, the project documentary film is at the bottom of this post, and this provides a really great overview of what digital storytelling is about. 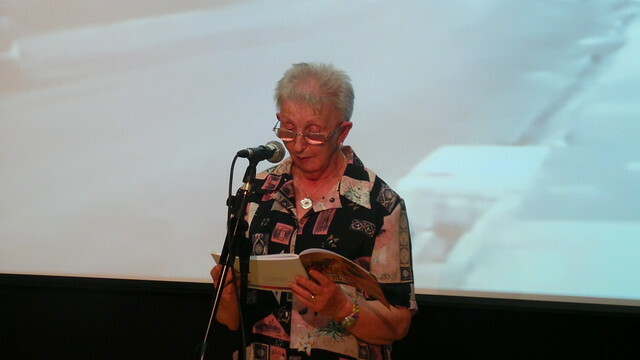 One of the key parts of Thursday evening was when some residents of a sheltered housing complex in Rutherglen were given the opportunity to read some of their own poems and stories, and to sing songs which they had contributed to the project. I found this extremely moving, and it further reinforced my view that storytelling is vital to older people’s health and well-being. There were some really poignant and moving stories being told, and almost all the people involved started the process by asserting that they had nothing of interest to say. That is rarely the case as Digital Commonwealth has proved. This Friday I’ll be running another Digital Tea Party, and this is one with a difference. 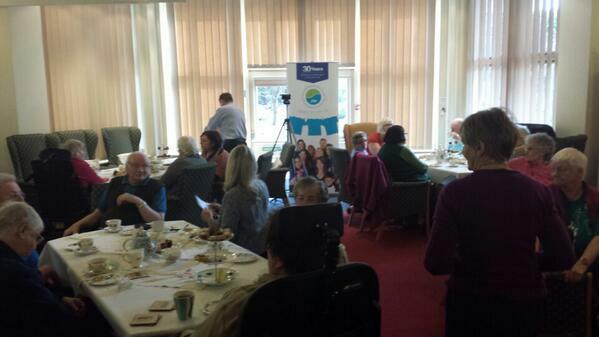 This Tea Party is being supported by Asda Foundation as part of Asda’s 50th Birthday celebrations. I am really pleased to be working with Asda on this, and I am extremely grateful to the inestimable and indefatigable Emma Bearman for helping to make it all possible. The event will take place at Westerton Close, Tingley, Leeds and we are working with ASDA Morley who will be providing food and drink, including, of course, a cake, as well as supplying a couple of Android tablets to help get residents online. As you probably know, I’ve been working hard to promote the idea that the best way to get older people online is to present new technologies in familiar, fun, environments, and to seek to find digital champions from within groups rather than forcing everyone to try to use equipment they are not comfortable with from day one. And it is further pleasing that Asda have come on board with this particular event as I have been advocating for some time that companies who want people to use their digital services need to get involved with assisting those who struggle to use them. There will be plenty of social media content associated with the event, which takes place between 1pm and 3pm this Friday (7th August). And look out out as well for some of the other exciting things Asda is doing to mark its 50th anniversary, including the recent “Cake My Day” Campervan tour. On Friday, the video below arrived. It’s the documentary film about the Digital Commonwealth project. If you missed it, Digital Commonwealth was a Big Lottery-funded initiative, led by the University of West of Scotland designed to use the 2014 Commonwealth Games in Glasgow as a hook to get ordinary people to use digital technologies to tell their own stories. 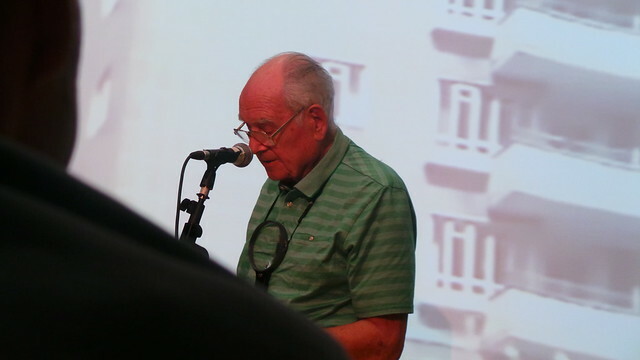 It was a wonderful mix of different approaches and work with different cohorts, ranging from songwriting and dance performances with primary school children, to video-making with pensioners’ groups. I was privileged to play a role, delivering some digital storytelling sessions to community groups in Glasgow, Edinburgh and Ayrshire. As Jennifer Jones, the Project Manager said to me, this video is probably the best tool for explaining what digital storytelling is about. I certainly don’t disagree. This is by way of a progress report on my ambition to put measures in place to make sure no older person needs to be lonely at Christmas 2015 if technology can provide a solution for them. This is a description of some things I have done, some I have observed and some I am planning. In some cases I am describing plans and concepts and cannot go into real details as there are negotiations on-going to confirm arrangements. Everything I am setting out here, though, is a practical contribution to ensuring that the barriers to new technology adoption among older people can be broken down. They are also demonstrations of what needs to be done. I could not claim that the totality of what is here is a comprehensive approach. We need to scale these initiatives up, roll them out across the country, and fill in the gaps. I am still looking for funding to make more of this happen. Please get in touch if you can help. During the past year I have run Digital Tea Parties in Leeds, Trafford, and Whitby, and there are a number of others in the planning stage. 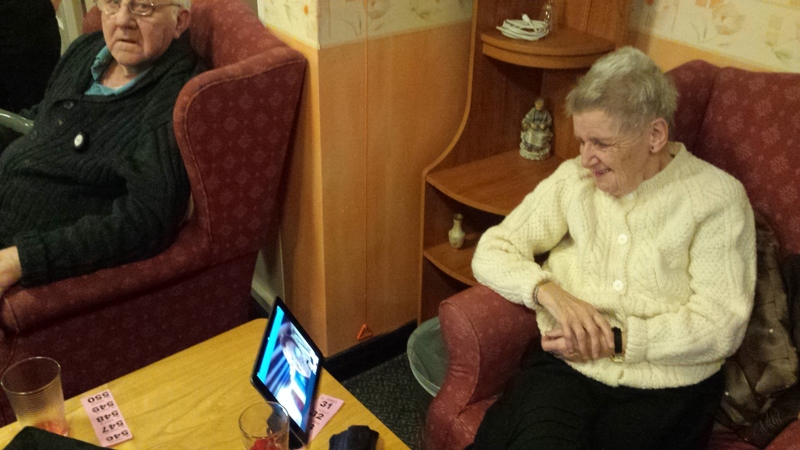 Digital Tea Parties are a great way of introducing older people to new technologies in a non-threatening environment. They allow the focus to be put on human communications and individual and community interests, rather than shiny tech. They are a familiar environment, in trusted locations, and they offer opportunities for those with a degree of interest to take the lead in introducing their peers to new gadgets. 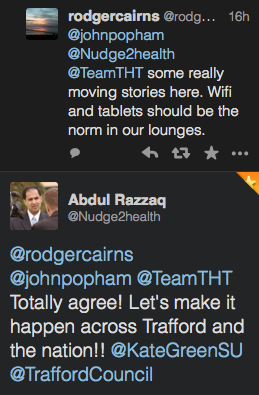 It is important in my view not to try to force people to use technologies they are uncomfortable with at the outset. Seeing others like them having a go can overcome that “tech is not for people like me” prejudice that often acts as a barrier. 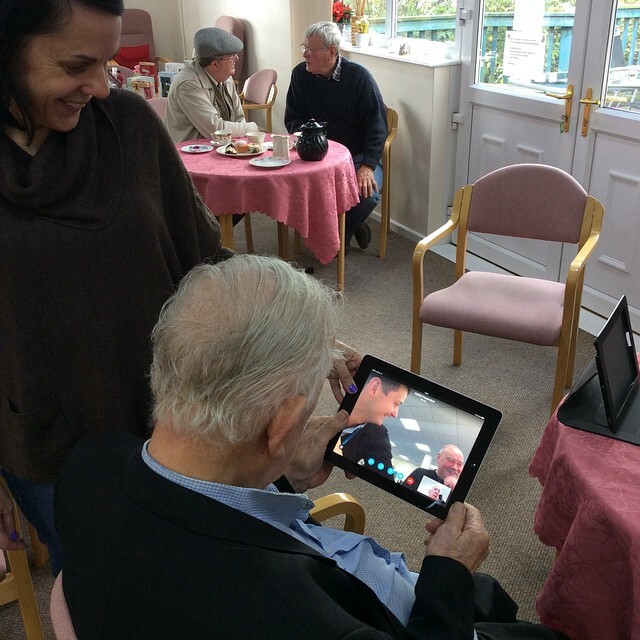 I am working with partners to connect up a sheltered housing complex, provide free wifi throughout and run a number of digital tea party-type sessions to kickstart residents’ use of new technologies. We intend this to be a demonstrator project that can be rolled out widely. I am convinced that one of the barriers to new technology adoption is that older people struggle to find content that is of interest to them. And, in addition to this, I believe that activities such as slumping in front of the television actually contribute to older people’s social isolation by disengaging them from the world around them. Work at Digital Tea Parties, particularly the reaction to the pub crawl video at Urmston, convinced me that people need content to engage with that is directly relevant to them, as I expanded on here. I have now secured funding as part of a larger project to develop this idea further and to create content which can be used with groups of older people to engage them with their local communities. I am also seeking funding to run this Seaside Recollections project in which I would tour seaside locations guided in real-time by older people in pursuit of their memories of childhood holidays. I am working on a number of initiatives to promote digital skills, confidence and fluency amongst staff working with older people. None of these yet have funding, which is extremely disappointing, because I firmly believe that often staff act as gatekeepers, seeking to keep the older people away from technology because they are frightened of the consequences of letting them loose on it. All of these are activities which can turn the tide in the battle to promote technology adoption among older people, and achieve the ultimate goal of breaking down loneliness and isolation. We need to roll these things out more widely and scale them up. If you can help, please let me know. Last night was the first Huddersfield session in the Cricket and Social Media project I am running with the ECB (England and Wales Cricket Board). When I devised the format for these workshops I borrowed the idea of kicking off with a discussion over a curry from the Social Care Curry movement. 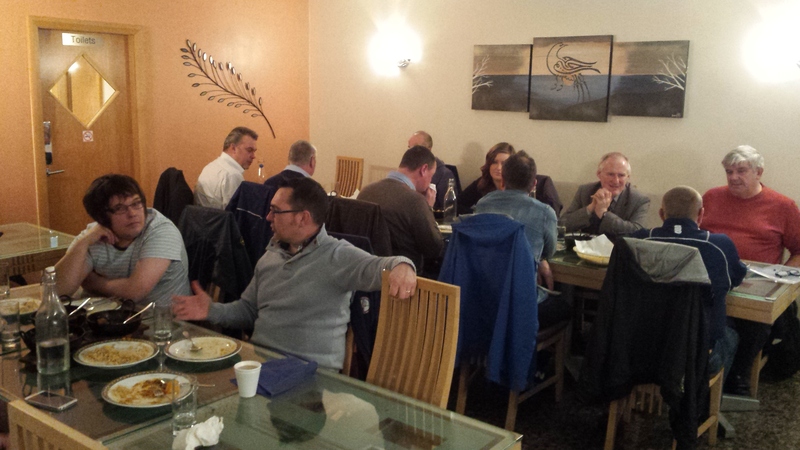 So the Huddersfield workshops began at Saims Restaurant. And, judging from what people said at the end, and on twitter later on, it proved to be a great success. This proves my theory that food is a great facilitator for conversations. Now all I need to do is to persuade all my clients to build a curry into every project I do. And so it happened! 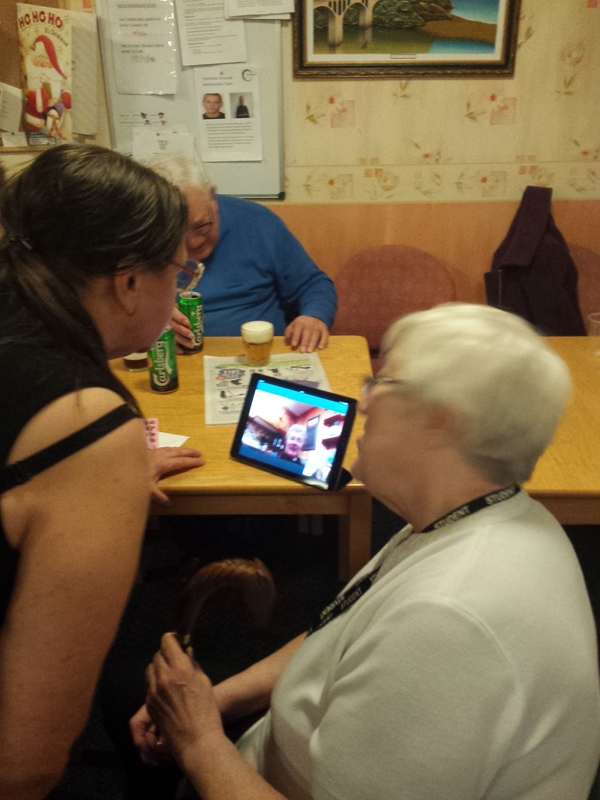 Five days after I posted this plea for people to help me to do something to prove that technology can help to do something about loneliness at Christmas I was at a Christmas Party in Urmston, Trafford showing residents of a sheltered housing complex how to use Skype, how to search the internet for pictures of their old neighbourhoods, and that Youtube is a treasure-trove of videos which is bound to have something of interest to them. It was thanks to Abdul Razzaq, Director of Public Health at Trafford Council, and Matthew Gardiner, CEO, and Rodger Cairns, MD for Independent Living, of Trafford Housing Trust, that all this was able to come together so quickly. It proves what can be done, with a bit of will. 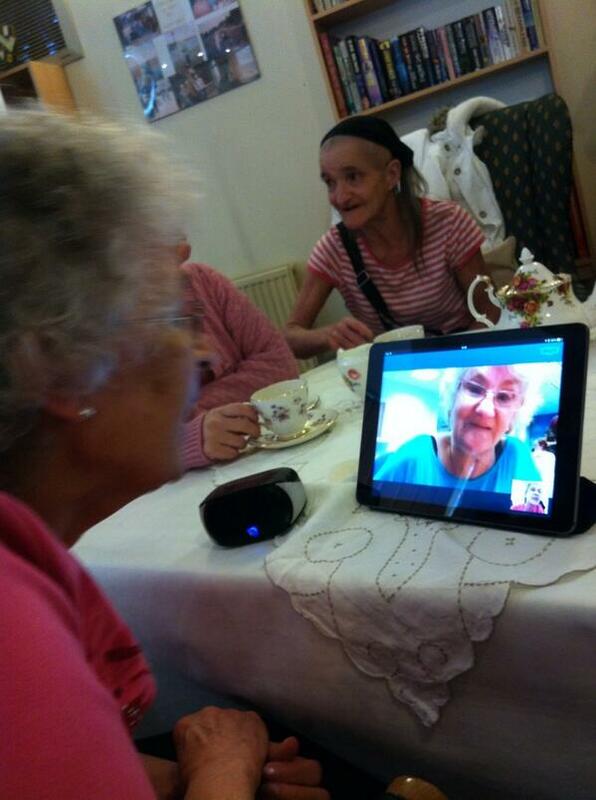 I know this sort of stuff works, because I’ve done Digital Tea Parties for older people before. The difference this time, was the challenge of fitting technology in with a Christmas Party, with the objective of proving that people need not be lonely and isolated at Christmas. A particular challenge on this occasion was that two hours of the party at Royle Higginson Court was taken up by singer, Little Mo, entertaining the residents. For that period there was little I could do, other than capture some of the atmosphere and give the outside world some insight into what was going on. For this aspect of such events in future, I would hope that we could build a network of potentially isolated people who could look in on the entertainment and enjoy it wherever they are. Having got to the party an hour early to set up, I had time, before Little Mo’s performance, to show a couple of Youtube videos on the lounge TV via my Apple TV; and we also did a brief Skype hookup with Chris Baker from Ongo who was running a digital inclusion session in Scunthorpe. 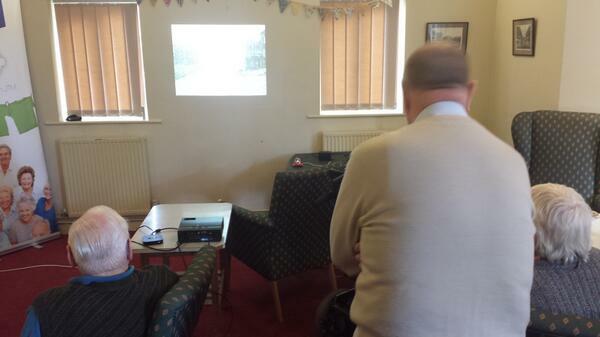 One particular Youtube video really fascinated the residents and we ended up watching it twice. It’s embedded below, and it’s a film from the 1950’s of two men acting out a pub crawl around Urmston. This really engaged the people at the event, not least because they agreed that all but one of the many pubs featured was still in business. This must be some kind of a record given the numbers of pub closures there have been over the years, particularly since the smoking ban. It got me thinking about whether we could recreate this video in modern-day Urmston. Who’s up for that? This discussion also gave me my first learning point of the day, as I was informed that Trafford General Hospital, which appeared in the video, was the first National Health Hospital. So, I attempted to capture some of the atmosphere as Little Mo sang for the residents. 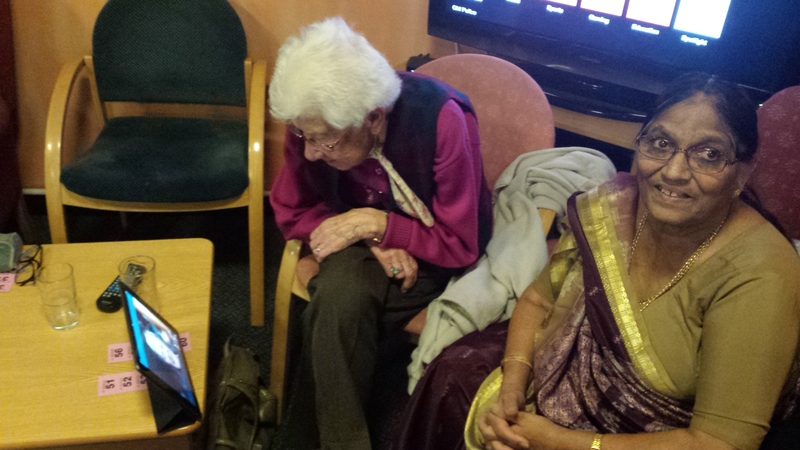 When the singing was over, there was an opportunity to engage residents in some of the tech opportunities. I accepted a challenge from one to find pictures of the road she was brought up on and which no longer exists. That quest was successful. And then, my good friend, Chris Conder, was kind enough to sit with a cup of tea in her kitchen in North Lancashire and chat with the residents in Urmston via Skype. A small number of residents, just did not want to engage, but quite a few were really pleased to chat with Chris, after they had got over the initial suspicion and surprise that this was all possible. Quite a few told me they were bowled over by the picture quality, and were amazed at what was possible. And then I met Tommy (below). Tommy had appeared not to take much interest in what I had been demonstrating, but, as I was about to leave, one of the other residents told me Tommy wanted to speak to me. 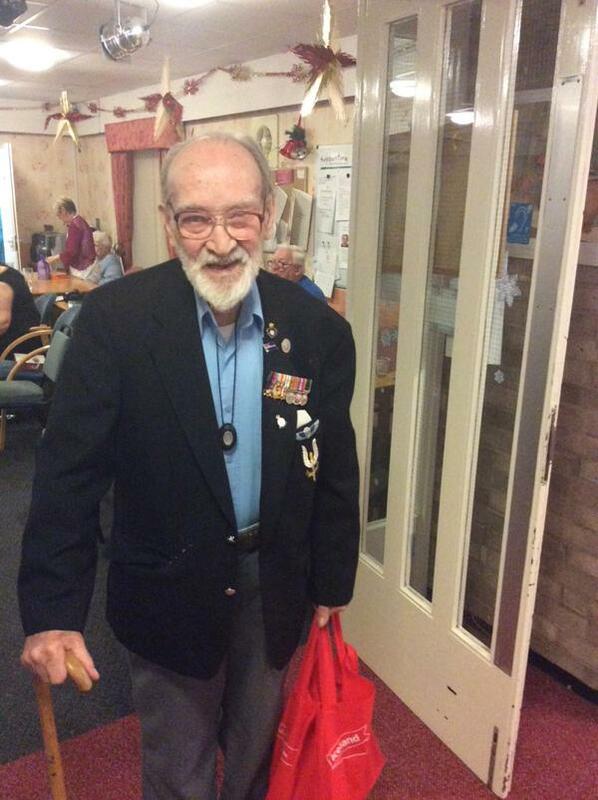 Tommy told me he was 91 and had never seen the point of the internet, but now he realised that he could use it to talk to so many people, he definitely wanted to get a tablet device. We had quite a conversation, during which he told me he was a singer, and that he had been in the middle of making a CD when the recording studio he was working with closed down. I asked him if he realised that a tablet could be used as a portable recording studio. He was a amazed by this, and said he definitely needed to get one now. It shows that, fundamentally, such technologies are simply aids to the ancient art of human communication and connection, which is what everybody wants at the end of the day. This was a pilot. It could have done with a bit more preparation, but it succeeded in that it opened up a number of people’s eyes to what it possible, and, as I said in the previous post, I want to be able to be doing a lot of these next Christmas, as we must seize on the opportunity offered by the heightened public awareness of loneliness at this time of year to change things. Of course, one of the real challenges of all this is being able to build on the initial sparked interest and ensure this results in some solid outcomes. I had a long chat with one of the residents who told me that he really regrets losing his confidence as he has got older. He said that he knows he doesn’t go out as much as he should, and he doesn’t really usually mix with the other residents, because of his diminishing confidence. This got me thinking about other ways we can use technology to help people who are in this situation. The “pub crawl” video went down very well, because it triggered memories, but also because it showed familiar locations. But most of the residents had few recent experiences of the venues involved. This is why I think it is important to produce video, including live streaming, and photography of local events. 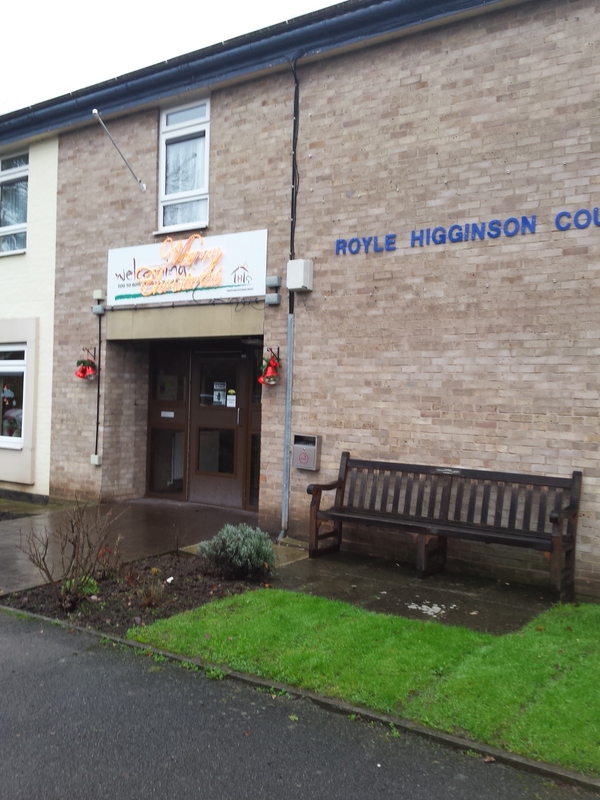 There is no reason at all why the residents of somewhere like Royle Higginson Court could not be involved in local events through watching them on the TV in their residents’ lounge. But that requires someone to be providing video and photography coverage of the events, and for the places like Royle Higginson Court to have the equipment (Smart TV, Apple TV or Chromecast), and staff knowledge to facilitate residents’ viewing. Why should people be forced to withdraw from their local communities as they get older and / or more infirm, when it is perfectly possible to facilitate their remote involvement? So, many thanks again to Abdul at Trafford Council, Matthew and Rodger at Trafford Housing Trust, Shona, the manager at Royle Higginson Court, but most of all, to the residents who let me in to their Christmas Party. I hope this can be the start of many more such events. I have been prompted into action by a piece on BBC Radio 5 Live this morning, about technology and social media aiding older people to overcome loneliness. Hurrah! I thought as I listened, finally this stuff is coming out in the open. You can hear the item below. Every year there are stories about older people being isolated and lonely in their homes; and yet, every year there are advances in communications technologies which potentially offer cheaper and easier to use solutions (at least in part) to this problem. But there is no joining up. What is the problem? I think society finds it really easy to hide behind its preconceptions and stereotypes about how older people would react to new technologies, and it uses this as an excuse to do nothing. And I think that technophobic professionals who project their own hangups onto the people they work with are a key barrier too. My own direct experience, through projects such as Our Digital Planet and Digital Tea Parties, suggests that, if approached in the right way, most older people will see the benefits of new technologies once exposed to them. So, let’s do away with the stereotypes and get on with breaking down loneliness. The lady featured in the Five Live report is a prime example of how this can work. So, now I want to do something directly about this. I am announcing now that by November 2015 I intend to have a project in place that will connect people at Christmas. It will focus on bringing digital elements to Christmas parties in Care Homes, Sheltered Accommodation, Day Centres and elsewhere, with a view to leaving a legacy of older people who are skilled and resourced to connect with each other and their friends and relatives over Christmas and beyond. Then please get in touch. And it’s not too late to do something THIS Christmas. Let’s pilot this idea. If you are running a Christmas Party for older people, you’d like to collaborate on connecting it up, and you can find a few hundred pounds to make it happen, then, let’s do it in 2014! Technology can break down so many barriers. Let’s shout this message to the world. It’s the Season of Goodwill, isn’t it? Well, actually, that phrase really irks me as I think it’s used by some people as an excuse to limit their quota of goodwill to a defined period of the year. For me, every day should be the Season of Goodwill, and that’s why I use the hashtag #365goodwill on Twitter. Nevertheless, there are certain traditions at this time of the year, and, this year I am going to join in with at least one of them. Starting on Monday 1st of December, I am launching the Social Media for Social Good Advent Calendar. Every day, for 25 days, up to, and including Christmas Day, I will be posting a short video clip with a little bit of my thinking on using Social Media to help make the world a better place. So, watch this space, every day during Advent. You can follow all the clips on the hashtag #adventsmsg on Twitter, or by clicking on the tag #adventsmsg on this blog. So, if you miss one, you can still find it. I hope you find this useful. I intend to have fun making the videos, which is partly what it’s all about really. It’s been more than 3 years since #Twicket, the world’s first live streamed village cricket match, but this Wednesday (3rd September), I am stepping back into the fray to live stream cricket again. This time I am working with Lincolnshire County Council’s Onlincolnshire broadband project to broadcast the PCA Masters v. the RAF game from Louth Cricket Club, which is one of a number of events that have been enhanced with technology to highlight the potential uses of better broadband. This time there will be no Brenda and no Vicar’s Son, but there will be a number of big-name former international cricketers, including Graham Thorpe, Devon Malcolm, Steve Harmison and Dominic Cork. And we are gathering a cast of local characters to add to the online fun of the day.